Outspoken Major in Bajoran Militia. Assigned as first officer of Deep Space 9. Former member of Shakaar resistance cell. Romantically involved with Odo. 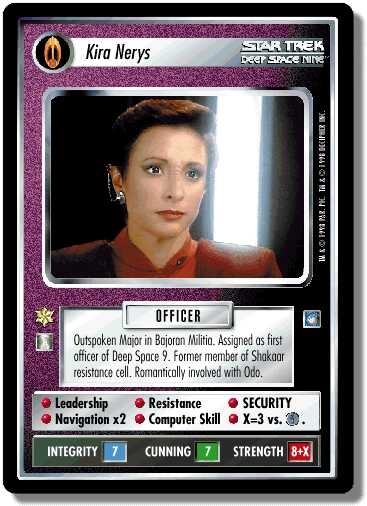 Navigation x2 Computer Skill X = 3 vs. .
Characteristics: "Here by Invitation"-related cards, "Reshape the Quadrant"-related cards, affiliation, Orb icon , Major, "Deep Space 9"-related personnel, "Shakaar Resistance Cell"-related personnel, Resistance, Bajoran species, matching commander, romantic partner. This personnel’s fourth skill is Navigation x2 and she is a former member of the Shakaar resistance cell. The Reflections foil version is misprinted (“Navigation” and “Skakaar”). There are 32 entries for Kira Nerys (ST1E 5 R 153) at the Tradeplace (25 haves and 24 wants). Click here to see all trade list entries for this Rare card!